ʻĀINA In Schools is a farm to school initiative that connects children to their local land, waters, and food to grow a healthier Hawai‘i. In addition to encouraging the use of locally grown fruits and vegetables in school meals and snacks, the program includes standards-based nutrition, garden, and compost curricula that empower children to grow their own food, make informed food decisions, and reduce waste. ‘ĀINA In Schools also provides field trips to local farms, chef cooking demonstrations in classrooms, as well as waste reduction, garden trainings, and events, and cooking for families and community members. ʻĀINA Curriculum Trainings will be held on Kauaʻi, Oʻahu, Maui and Hawaiʻi Islands this year. Email [email protected] for details. Kōkua Hawaiʻi Foundation Field Trip Grants help bring students to outdoor sites where they can experience hands-on learning about Hawai‘i’s environment. Preference is given to Hawai‘i public schools which otherwise could not participate in environmental field trips. Applications are being accepted now through March 1, 2016 for funding up to $1,000 per school. 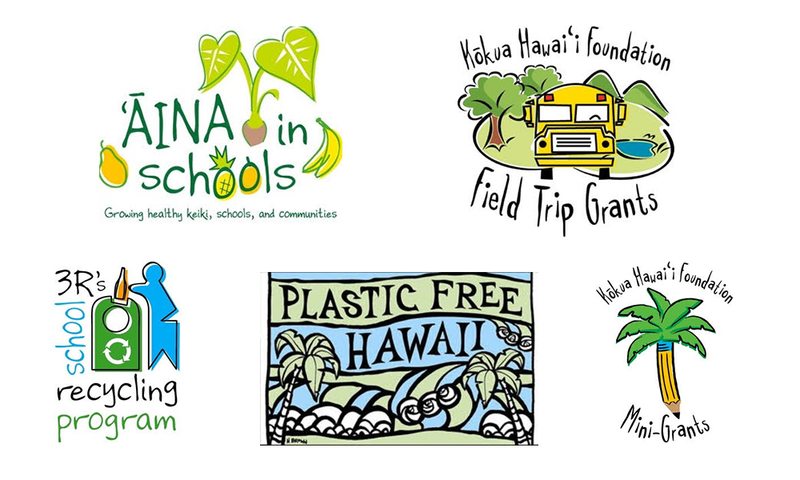 Kōkua Hawaiʻi Foundation Mini-Grants fund projects and teachers from Hawai‘i schools to assist in advancing their environmental goals in the classroom and pursuing stewardship endeavors. The program offers assistance to schools which otherwise could not purchase items or services needed to reach their goals. Applications are being accepted now through March 1, 2016 for funding up to $200 per teacher or $1,000 per school. Plastic Free Hawaiʻi provides resources, tools, and trainings to educate schools, business partners, and community members about the environmental and health benefits of going plastic free to minimize single-use plastics in our islands. The program supports communities and schools in coordinating beach cleanups, film screenings, and docent trainings to deliver Plastic Free Hawai‘i educational presentations. The next Plastic Free Hawai‘i Beach Cleanup will be on September 19th in conjunction with International Coastal Cleanup Day. 3R’s School Recycling Program empowers students to engage and educate their school community about the 3R’s (reduce-reuse-recycling). The program provides educational resources, trainings, and materials to support on-campus recycling efforts and hosts Aloha ‘Āina Recycling Drives at select 3R’s participating schools across O‘ahu, with host schools receiving proceeds from recycled material. Contact us now if you are an O‘ahu school and interested in scheduling a recycling drive. Kōkua Hawaiʻi Foundation Educational Events throughout the year allow us to share a variety of environmental education initiatives with a broader community audience including parents, educators, and school administrators. Be on the lookout for upcoming events including film screenings, presentations, trainings, workshops, and conferences. In addition to the above programs, numerous environmental educational resources are available on the Resources page of our website. These resources include Green Grants for Schools, Green Fundraising Ideas for Schools, Healthy Snacks & Waste-Free Classroom Celebrations, Healthy & Waste-Free Lunches, and more! If you would like to learn more about Kōkua Hawai‘i Foundation’s programs, grant application process and resources for educators, please visit www.kokuahawaiifoundation.org.